How to choose a granite countertop? This is a question that many homeowners are facing when they plan their new kitchen or want to remodel their dated kitchen or bathroom. Finding the perfect granite countertop is sometimes difficult as the stone comes in such a wide variety of colors, characteristics, price range, appearance, etc, that it can get really hard to choose between all the options available on the market. What is granite? This is an igneous rock of volcanic origin and is formed from magma. It is formed at great depths and pressures as a result of cooling and solidification of molten materials. It may contain a variety of minerals depending on the place of origin which affect the color and overall appearance. Granite is one of the most popular materials for kitchen and bathroom countertops because of its exceptional strength and durability, as well as its unique beauty. Granite countertops can look luxurious and elegant or sleek and modern, depending on their color, finish and the processing method. Nowadays the material is quarried in many countries around the world and customers can choose from a wide variety of colors. Every slab is unique and you can hardly find two identical ones. The choice of colors is unlimited: green, blue, black, pink, white, yellow, red, gray, etc. In addition every type has its own special texture and veining, sometimes crystals and mineral deposits in the stone form large intricate designs, glittering specks, and sometimes the granite has almost monochrome color. Granite is considered to be the most solid natural stone. Not surprisingly, it is the most popular choice for floor coverings, construction of buildings and monuments and, of course, countertops. A granite countertop immediately changes the appearance and the atmosphere in any kitchen, even be the focal point of the design. It has many advantages when compared with alternative materials. We shall have a detailed look of all the pros and cons of granite countertops and see what benefits they offer to the homeowners. What are the most important advantages? 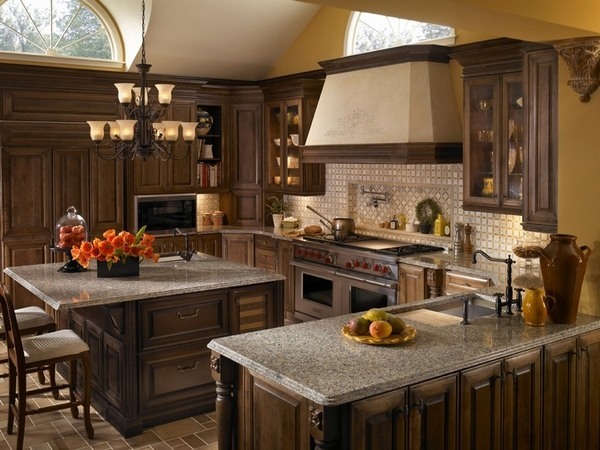 Strength and durability – as we said, granite is considered to be of the strongest options for kitchen countertops. Diamonds are the only stone harder than granite, making it virtually impossible to scratch. It is exceptionally durable and retains its perfect condition and original appearance for many years. 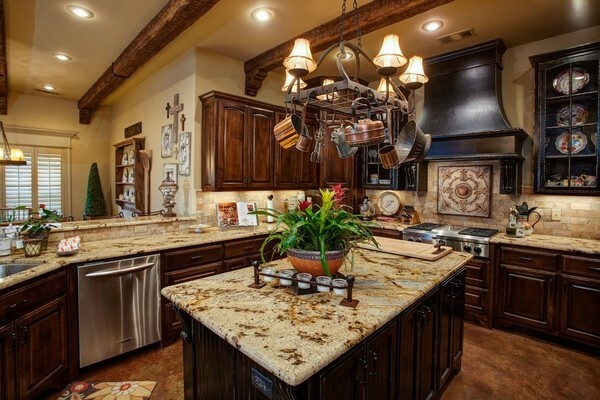 Once you have your granite countertops installed, you can just forget about them. Strength, durability and ease of maintenance make them the favorite choice of housewives. Versatility – these counters are versatile and work harmoniously in any interior design style. 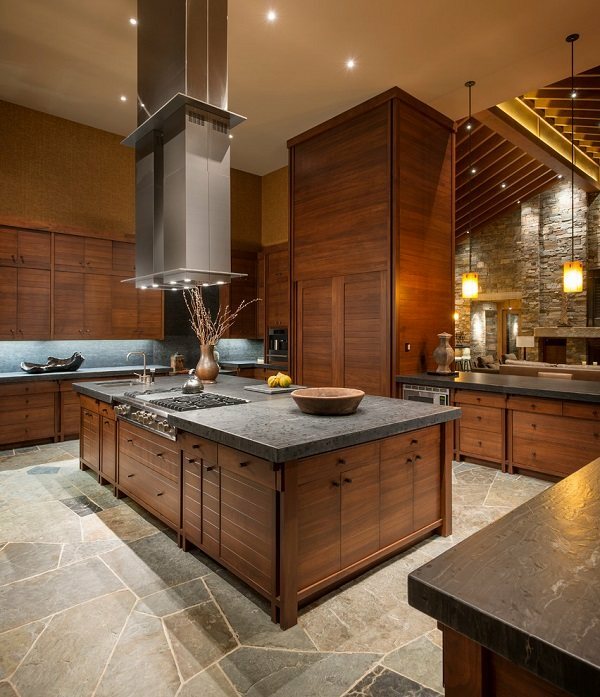 Granite, as a natural material, is easily combined with many other materials – wood, steel, wrought iron, ceramic, clay, and will be amazingly beautiful in a rustic interior and in a contemporary interior. It can be used anywhere – indoors or outdoors and you can match the countertops of your outdoor kitchen with the ones inside the home. Value – granite countertops add value to your property and besides that you do not need to worry that you installed your one years ago, as they simply do not depreciate in value. In addition, choosing a granite countertop is one of the quickest ways to change the appearance of your kitchen, and to add not only financial but aesthetic value to the kitchen. Many people prefer to keep their kitchen cabinets and only add beautiful natural stone, which is significantly cheaper than a complete kitchen renovation and remodeling. Installation – granite countertops are installed relatively easy. However, it is better to trust professionals for the installation. It is not a DIY project for beginners and when you trust experts for the cutting, installing and sealing, you will have a guarantee that your countertop will have the perfect look and you will enjoy it for many years. Appearance – being a natural stone, granite offers an amazingly beautiful natural look. The countertops are elegant and designed to please the eye with the beauty that Nature created. Very few other materials can offer the same variety of colors, textures and veining. 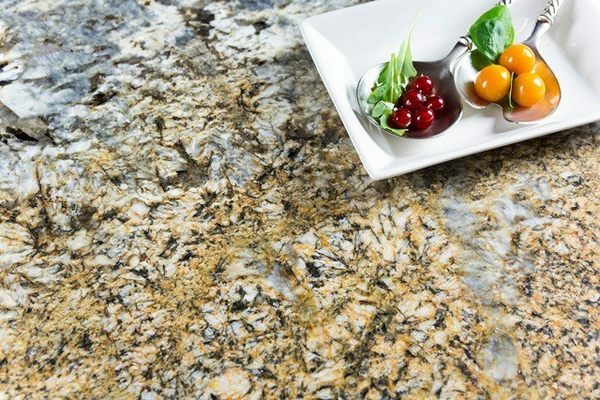 Colors – granite comes in a huge palette of colors, texture and veining. 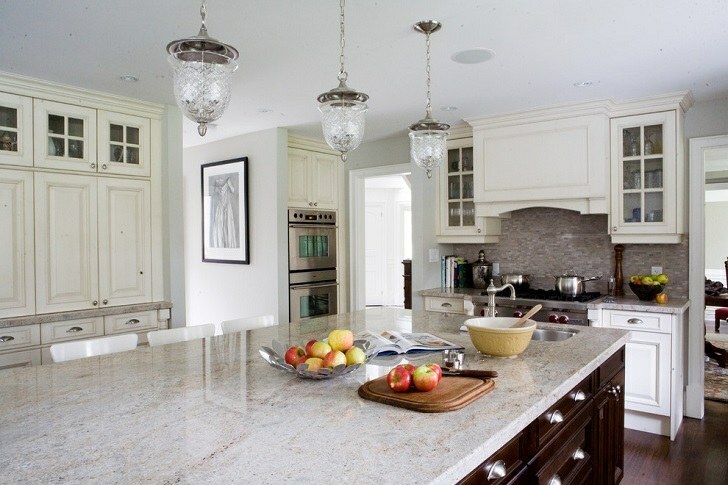 It is almost impossible to find tow identical slabs which makes granite countertops a unique asset to any home. The color of the stone will depend on the origin, the depth of extraction, processing and finishing method. In today’s market, you can find more than 3000 designs and no other material offers such a huge choice. Customers can choose from inspiring colors like deep burgundy red, green with sparkling quartz deposits, swirling veining, and if you are a fan of more traditional designs – peaceful neutral shades beige, gold, and brown, copper, caramel or chocolate, black or white – granite countertops will perfectly fit into any interior and add character and high-end look to any home. Resistance – granite is very dense and hard. Their resistance to varoius factors is incredibly high. 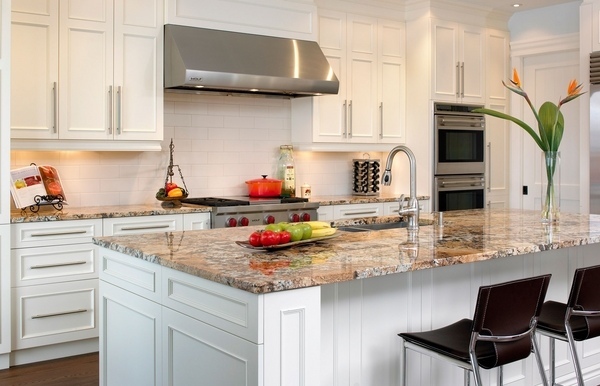 One of the most frequently asked questions refer to what granite countertop are resistant. We shall give you a list, so that you are fully informed. Granite countertops are heat resistant. 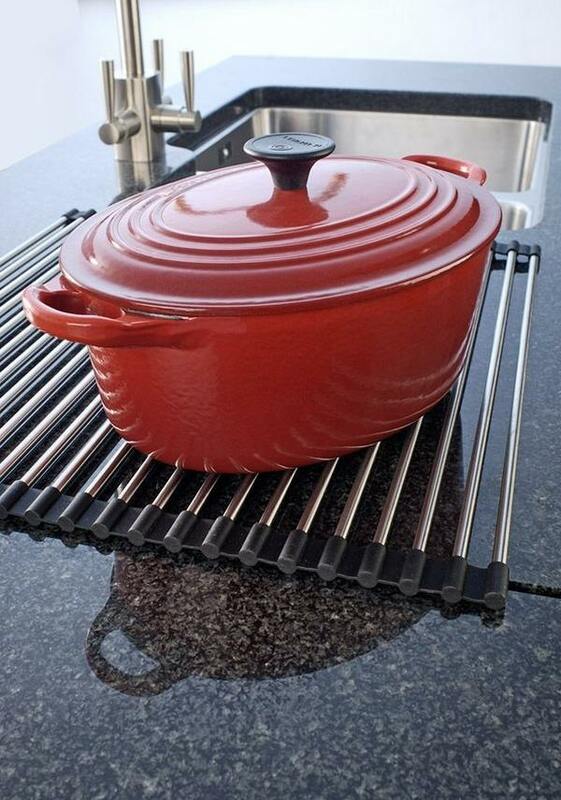 They withstand high temperatures and drastic temperature changes and easily withstand the heat of hot pots and pans without damage and you can take dishes out of the oven or pots and pans off the stove and set them directly on a granite countertop without fear of damaging. Granite countertops are water resistant. You do not need to worry about spilled water or any other liquid on its surface. If wiped up within a few minutes, it will not stain the surface. Scratch resistance – granite is exceptionally hard and extremely difficult to scratch or dent. If you wonder whether to use a cutting board, the answer is – yes, but it will protect your knives from dulling. Acid resistance – granite countertops are resistant to most acids, such as soft drinks and juices. In the event of spilling orange juice, lemon juice or any other acidic food or drink, they will not damage the surface. Wipe them off and that is all it takes. 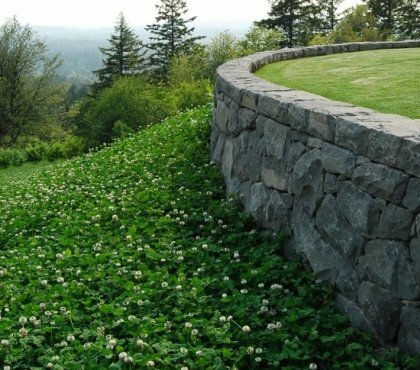 Resistance to bacteria – Natural stone is harmless to humans and the environment, as it is a clean material. It is resistant to a variety of bacteria and in addition it is mold and mildew resistant. Lifetime – One of the main advantages of granite is its longevity. It will last forever and when properly maintained it will never lose its inital appearance. Maintenance – it is easily maintained and further in the article you will find a lot useful tips for the maintenance of granite countertops. 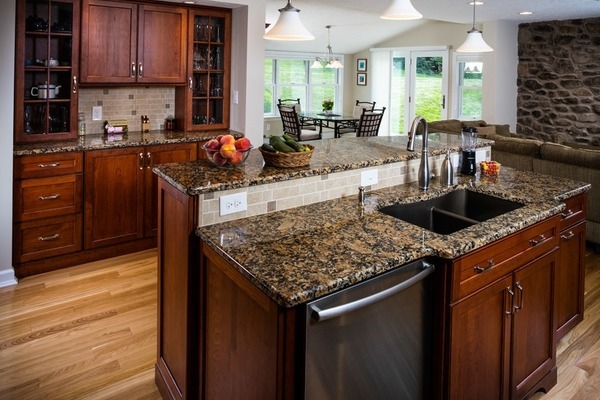 What are the disadvantages of granite countertops? As you can see granite countertops have many advantages, but like any other material they also have a number of disadvantages. We said thatthey will last a lifetime, but this could be a huge disadvantage at the same time. You cannot change the color if you get tired of it, you will have to replace the whole countertop. You cannot paint or stain it when you want to change the color scheme of your kitchen. The unique appearance of the slabs and the fact that you can hardly find two slabs identical in color, pattern, veining or texture could be a problem when you want to install granite countertops on a large area and want a uniform look. Even if you wanted to replace a part of your countertop after a few years there is a very little chance that you will find the same pattern again. 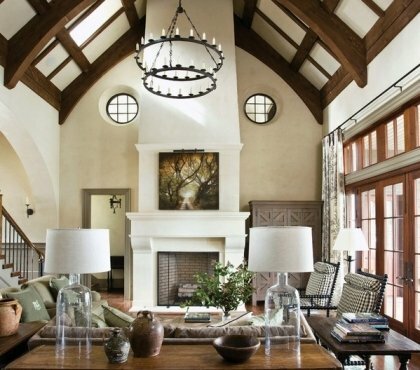 Some homeowners prefer to buy an additional quantity with the selected pattern in case they need to replace parts of it. Weight is another drawback – granite countertops are very heavy and during installation may require additional structural support, especially in spans and cantilevers. The installation is a laborious and complex which adds to the cost. Once installed and glued onto the cabinets, granite countertops are difficult to remove. 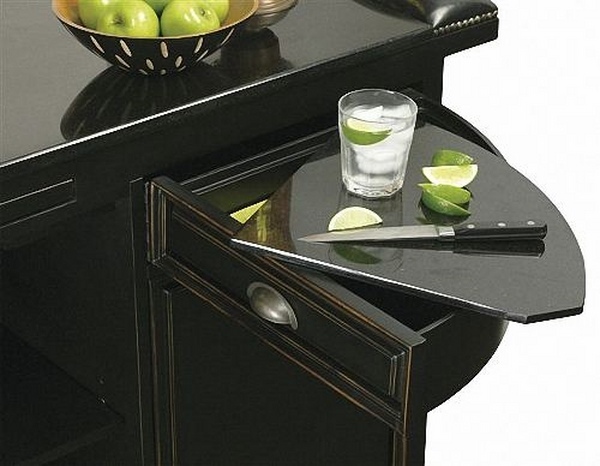 If you try to remove the countertop by force this may result in damage to the cabinets. 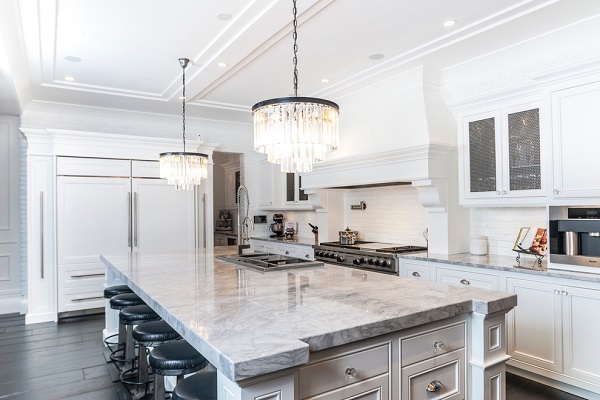 Maintenance and care – Despite the fact that granite countertops are easily maintained on a daily basis, they need to be sealed as natural stone is a porous material. 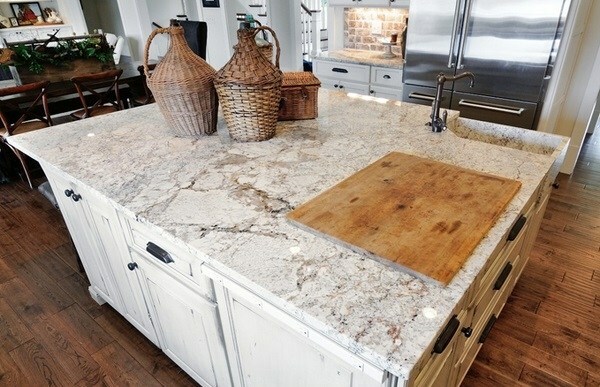 In case that the countertops are not properly sealed, they are not resistant to stains or bacteria. 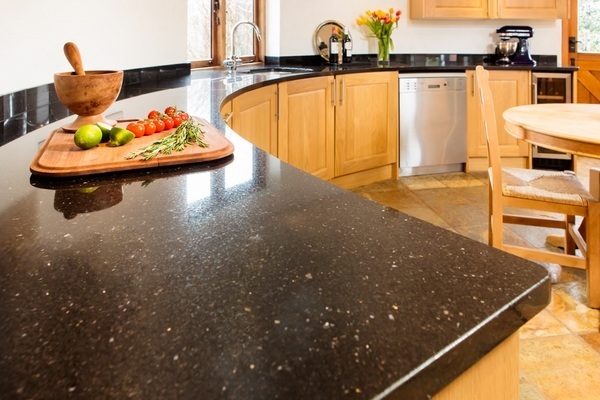 Liquids like coffee, black tea or red wine may stain your granite counetriop forever. In addition, they have to be re-sealed every year or two. Although very hard, they can suffer damage and crack when hit by a hard, sharp object. Price – Probably the most significant drawback of granite countertops is their cost. They are expensive compared with other materials. Knowing the pros and cons of granite countertops you will be able to decide whether the choice is a good option for your kitchen or not. 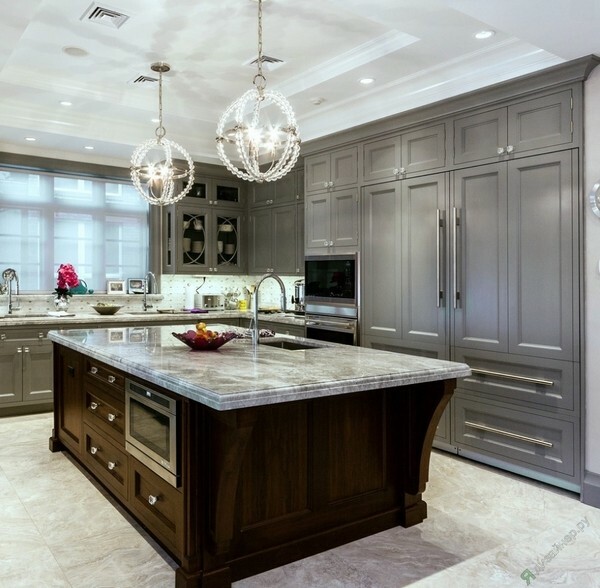 Pros and cons of quartz vs granite – which one is better? Finishes, edges and profiles – how to choose the right finish? 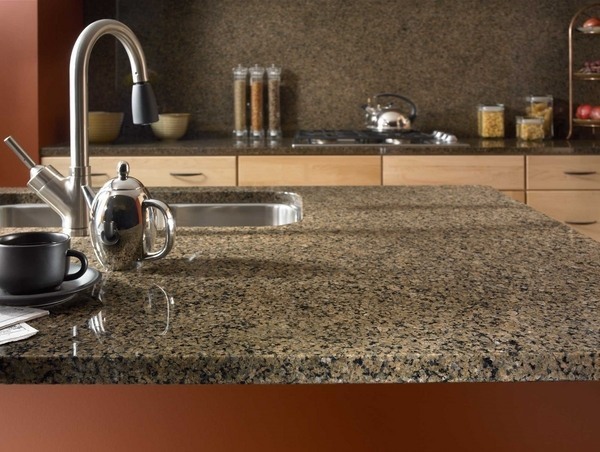 Granite countertops come in a variety of finishes and it is the finish that gives the appearance. The edges and profiles add to the look and depending on the design of your kitchen, your personal taste and preferences you can choose from many different types of finishes. The type of finish not only affects the appearance but also affects the maintenance so you need to know the pros and cons of each type of finish. The process of finishing a granite slab requires special equipment. The slab goes through a series of polishing wheels where abrasive pads are fitted and the pads are grinding the stone by pressure. How to choose the right finish? Do you prefer a polished or unpolished surface? A shiny surface adds elegance and modern feel to the kitchen while unpolished surfaces create a more simple and casual feel and atmosphere. There are different ways to finish a granite countertop. The most popular, or basic finishes are polished, honed and leathered. 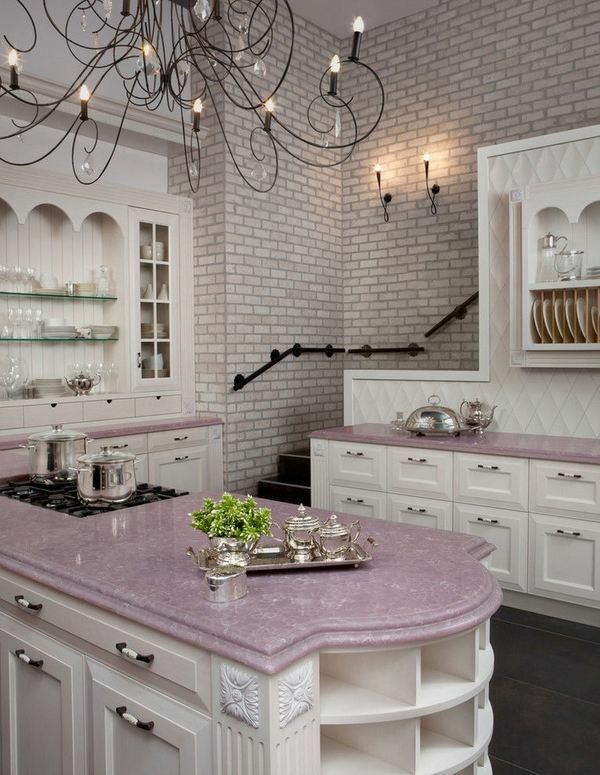 Polished countertops are the most popular choice of customers and often the focal point in the kitchen design. They have a smooth, high gloss mirror surface which reveals the color and texture of the stone, giving it a rich and modern look. A polished surface is cleaned easily as the polishing makes the surface less porous and prevents staining. Granite holds the polish for years and in can be polished again, if needed. A disadvantage of polished surfaces is that they cannot hide imperfections and despite the fact that this finish closes the pores, your countertop still needs to be sealed. In terms of design, a polished countertop can steal the attention from other features of your interior. A good designer’s tip is to mix the surfaces, especially if you already have glossy elements in the kitchen. 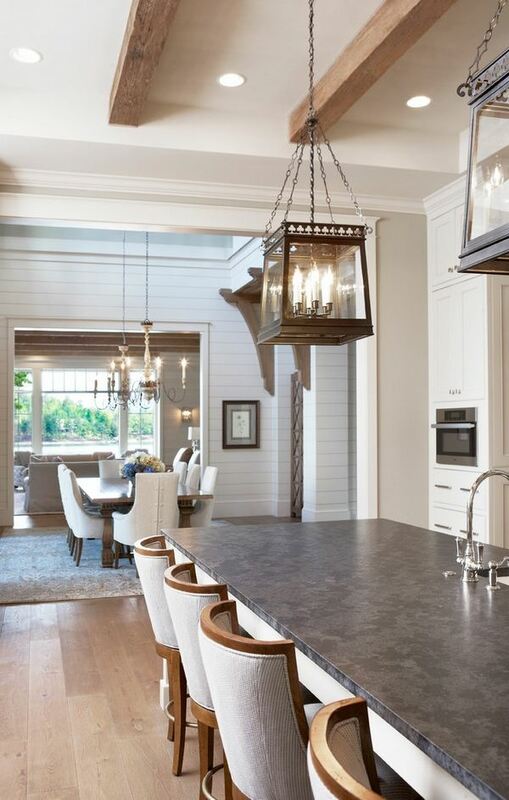 Too much gloss may be overwhelming, so use a polished option on the kitchen island and honed or leathered finish on the perimeter or vice versa. 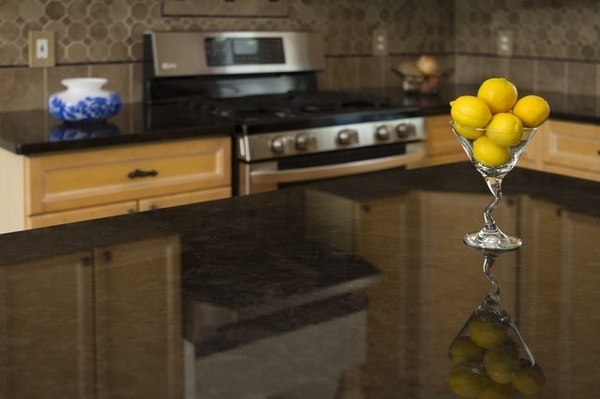 Honed granite countertops have a beautiful satin-like, non-reflective surface. A honed finish (matte finish) is as smooth as the polished finish without the shiny look. It hides imperfection better as well. A honed finish adds texture and is slightly more porous than the polished finish which makes the countertop more susceptible to staining. Honed surfaces should be re-sealed more frequently to avoid damages on the surface. 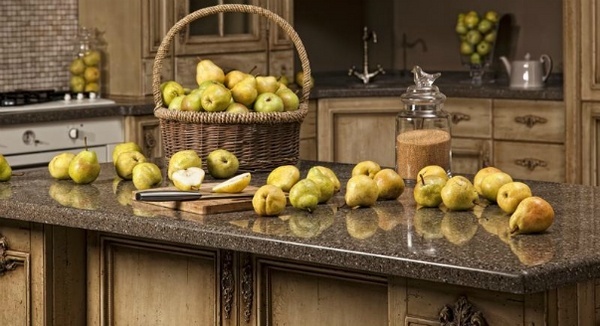 Leathered granite countertops (rough, brushed, antiqued finish) have a rough non-reflective appearance without any shine or gloss and the surface has the texture of leather. 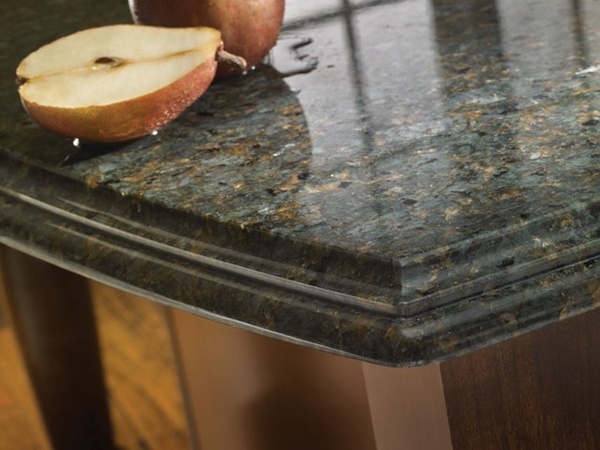 A leathered finish gives a sophisticated look to the stone and closes the pores of the stone better than the honed finish which improves the stain resistance of the countertop. While the honing washes out the natural color of thestone, the leathered finish retains it and hides imperfections, fingerprints and water spots perfectly. In addition to the three most popular finishes customers can opt for river washed finished, caressed finish, antiqued, Tuscan, brushed, which are more or less variations of the basic types of finishes. Once you choose your type of finish, you need to decide what type of edge (profile) you want. 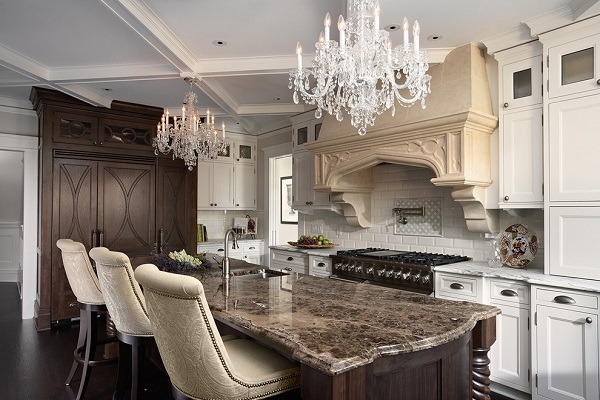 The type of profile will determine the final look of your countertop and accent on the style of the kitchen design. In addition to the decorative function and from a practical point of view, the end profile of the countertop protects the edges from chopping or cracking. Generally, edges can be classified as standard and custom edges. Another classification divides edges and profiles to straight, curved and decorative (premium). Custom edges come under different names so one and the same profile may have one name in your seller’s shop and another name on the internet. Standard edges are offered mostly for free at the time of purchasing. They are also referred to as “basic”. The most popular edge finishes are straight, bevel, bullnose, eased, ogee, pencil, etc. 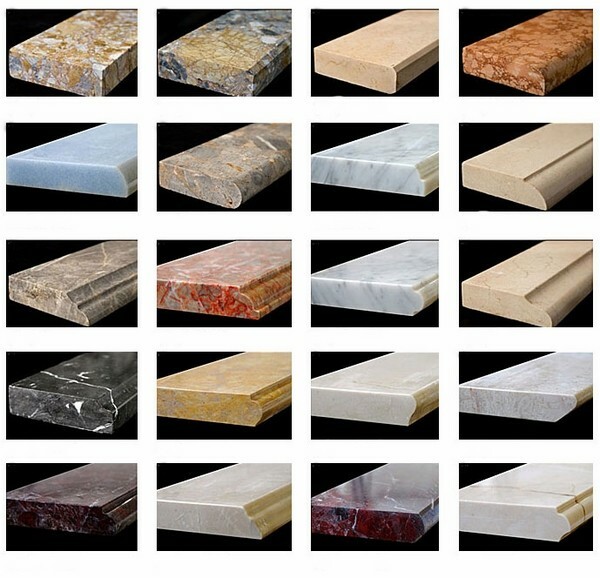 Each of those has a number of varieties and the overall number of edge profiles to choose from is very big. How to choose the color of the countertop and match it with the kitchen cabinets? Once you have you have weighed the pros and cons and decided to install granite countertops in your kitchen, you shall be faced at the challenge to choose the color of the countertop. The color depends on the mineral deposits in the rock – quartz (gray grain), feldspar (pink and white) and mica (black). The first step is to decide whether you want dark or light granite. 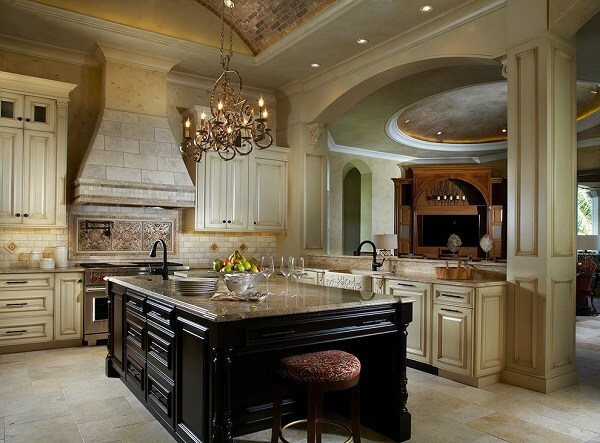 When the kitchen is designed in dark colors, a dark countertop will make it appear even darker. The second step is to decide whether you want to use a variety with expressive veining or a more uniformly colored slab. 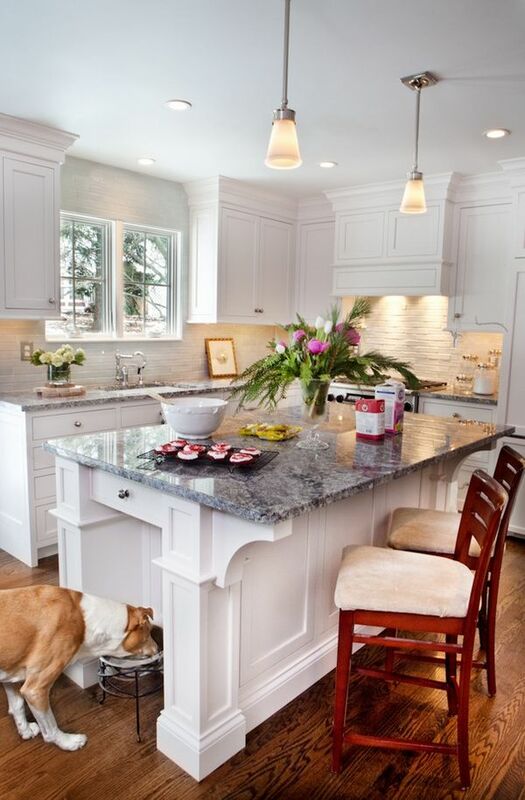 A small kitchen will appear visually smaller if you use a slab with lots veining. 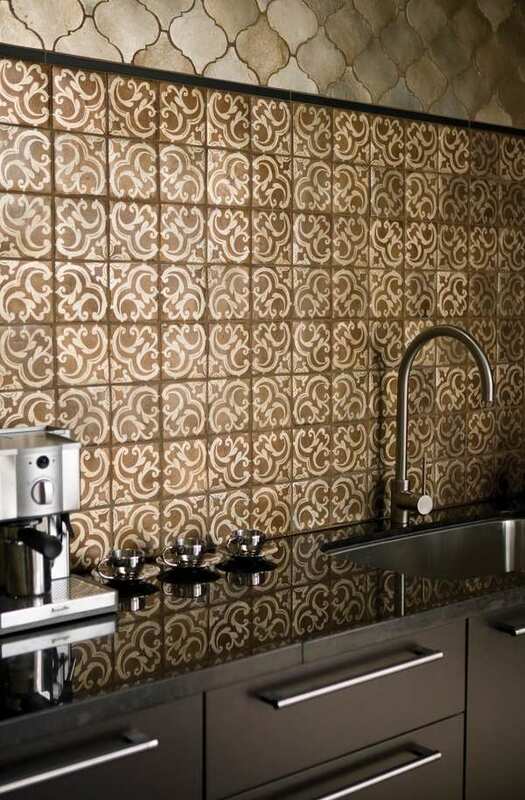 These will be a good choice for large kitchens where the visual effect will not overwhelm the interior. When you select a slab it is better to take a small sample home and see it in home lighting because the lighting in a shop is always different from home lighting. Check how the granite looks when illuminated by natural light and artificial light. Purely white granite does not exist. White granite has strips and flecks of other colors on a white background. These varieties are quarried mainly in China, Italy and Brazil. For example, “White Nepal” comes from Brazil and has distinctive small black dots on a white background. White ice granite is also quarried in Brazil and has blue and gray specks on a white background. 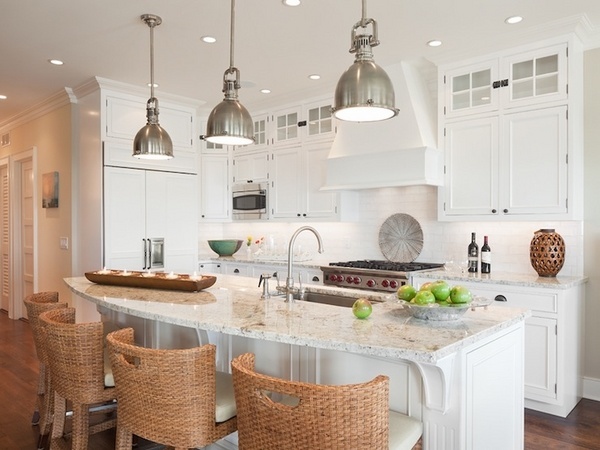 Beige, cream and brown granite or neutral color countertops are among the most popular choices as they work with almost any other color and interior decoration scheme. Beige slabs have shades of dark brown, light brown and white and is most often used in interiors in traditional style as it creates a warm and welcoming atmosphere. 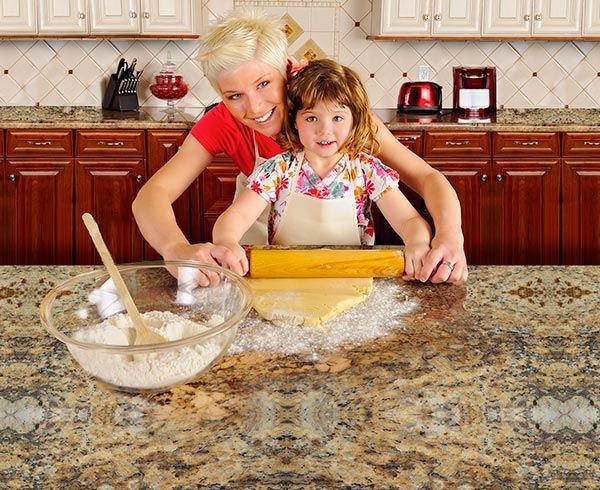 Yellow gold granite colors range from the lemon-yellow Brazilian “Persa Amarelo” to exotic yellow with black stripes “Yellow Tiger”from China. These golden shades warm the kitchen and light up any room. When polished, they look incredibly elegant, luxurious and rich. 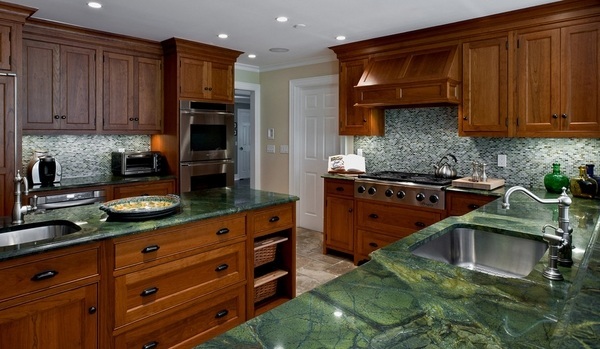 Green and blue granite countertops are amazingly bright and vivid. They add an exotic touch to the interior and very often are combined with granite countertops in white, black or red for visual contrast. 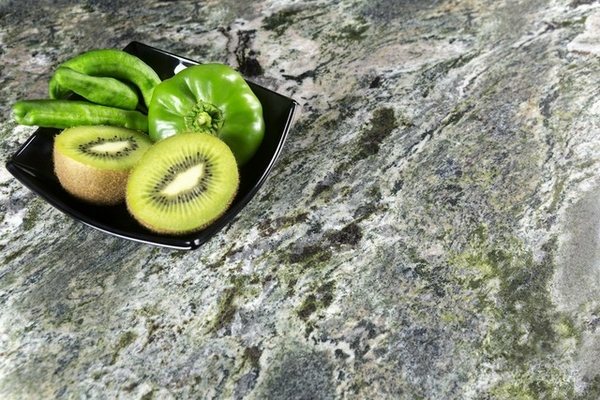 Green granite has so many varieties – “Emerald Green”, “Atlantic Green”, “Green Pine” – and each type has a different veining – beige, brown, grayish, with spectacular deposits of sparkling speck and large crystals, that the design opportunities are limitless. 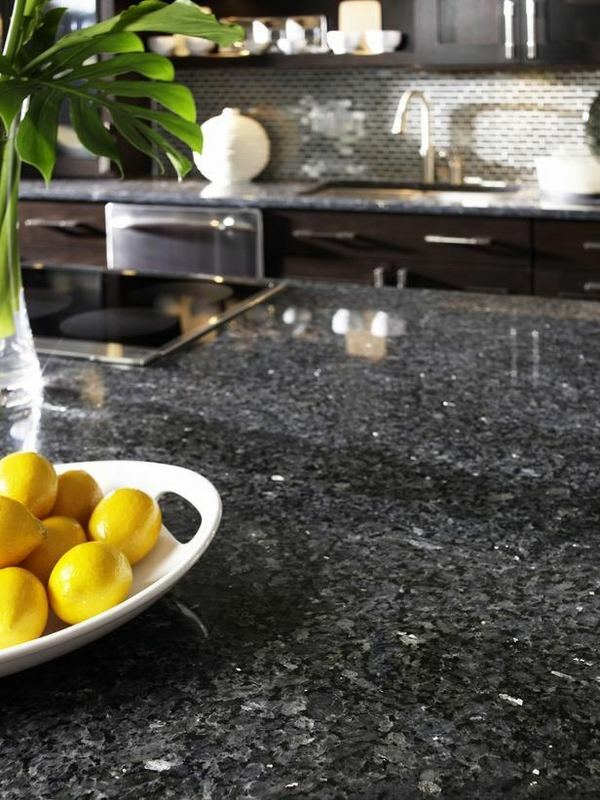 Blue varieties of granite are found in a range from grayish blue to bright blue like “Azul Bahia” from Brazil. 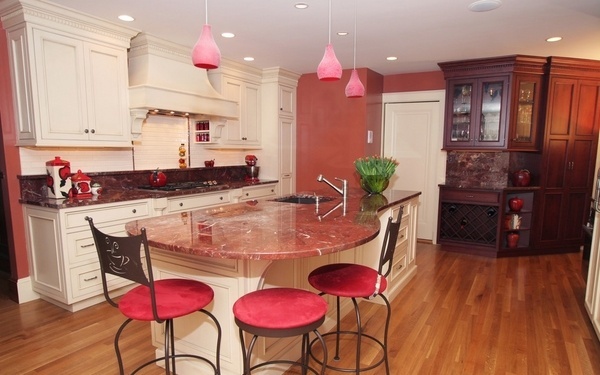 Red granite countertops may vary in color from bright red to pink. 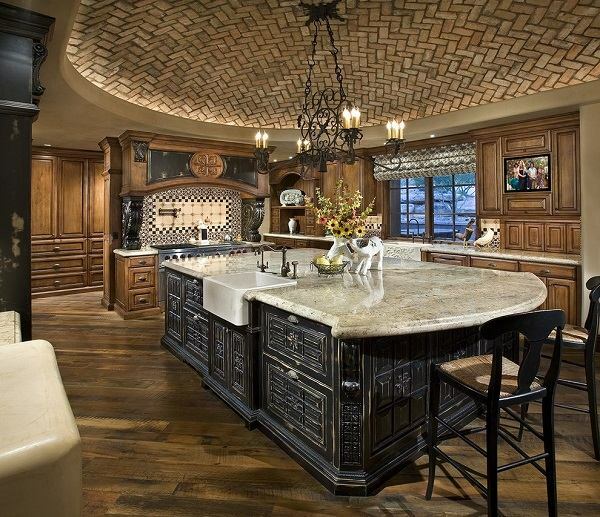 Red granite countertops are stunningly impressive. Actually the pink varieties of granite from Brazil and China, such as “Shan Hua Hong”, are among the rarest. Their color varies from pink to purple with splashes of gold and white crystals. Some granite feature contrasting dark gray and black specks. If you want to make a statement and a bold choice then the bright and spectacular “Archipelago Red” from Finland is your granite countertop. 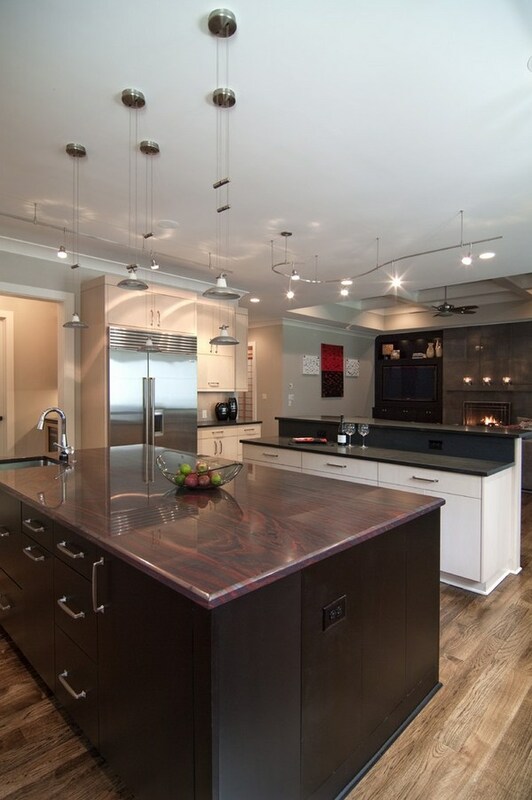 Black and gray granite countertops give a very modern and sophisticated look to the kitchen. 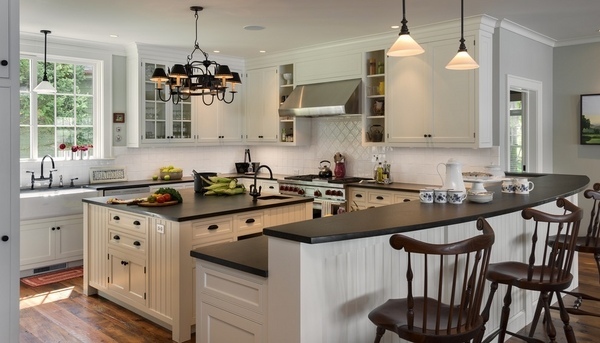 Solid black granite is ideal for the monochrome black-and-white color scheme, although this color goes well with almost any other while gray granite fits into a variety of decorative schemes and kitchen interior color solutions. 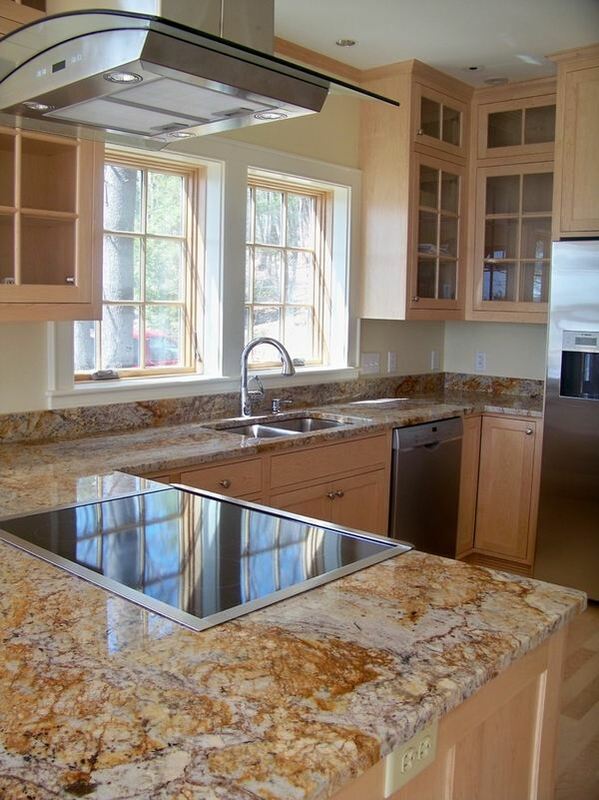 How to combine the color of granite countertops and kitchen cabinets? There are basic rules for combining the color of the countertop with the color of the kitchen cabinets. One of them is that lighter shades are more suitable for dark kitchens. 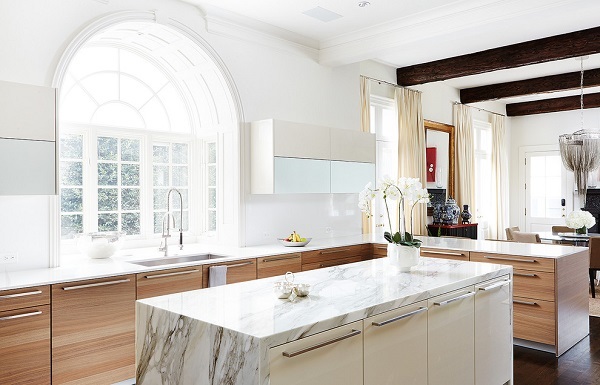 An exception can be made if your kitchen is very large with lots of natural light. However, all the rules can be followed or broken, depending on the visual effect that you want to achieve. The best rule is that the color combination has to please the eye and the best way to make a good choice is to test the samples and see how colors work with each other. There are numerous color combinations and each one has its own charm, so choose the one that suits your taste, individuality and personal preferences. Granite countertops for kitchen cabinets in neutral colors like white, black, beige, gray, wood – there are many options to choose from. 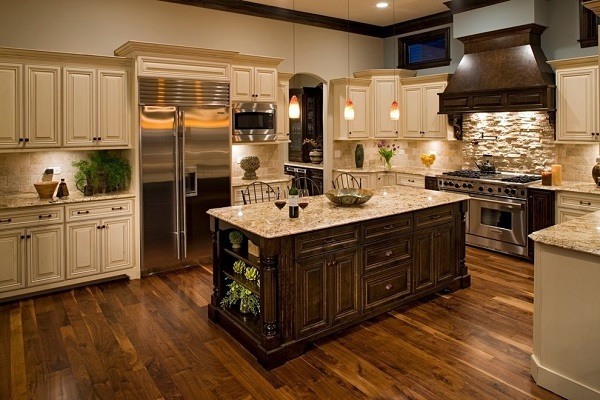 Beige or cream kitchen cabinets will be complimented by coffee brown or chocolate brown shades. Black and gray are also a good choice and if you want an airy appearance choose white countertop for white kitchen cabinets. 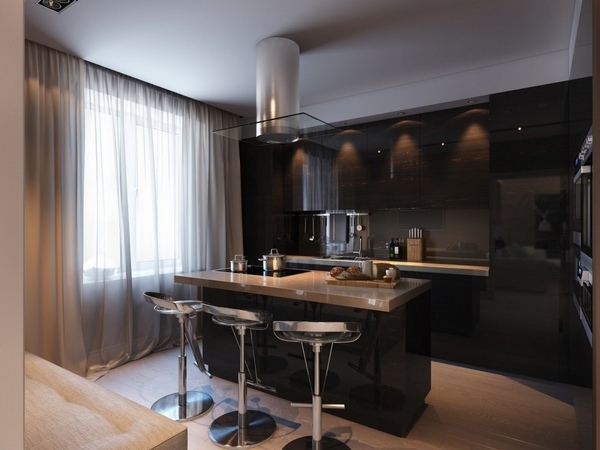 Darker colors will emphasize the purity of the kitchen cabinets facades by creating a contrast. 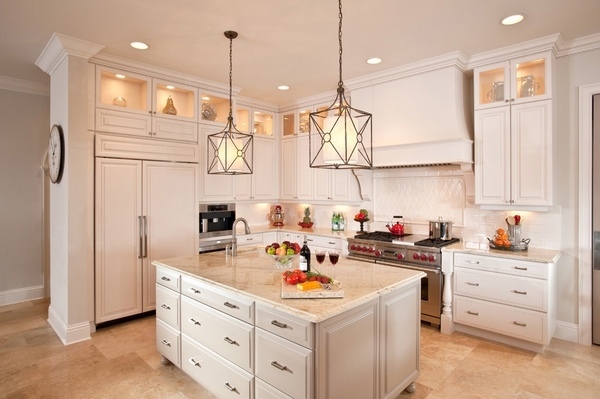 Kitchen cabinets in wood colors work best with cream shades. When you want a visual contrast you can use black, but this is a risky combination and will depend on light conditions and kitchen color scheme. White kitchen cabinets combined with a black granite countertop is a combination that has a lot of admirers as it looks elegant, stylish, modern and classy. For black kitchen cabinets is better to choose white or opt for a countertop in gray shades, as well as other colorful option. 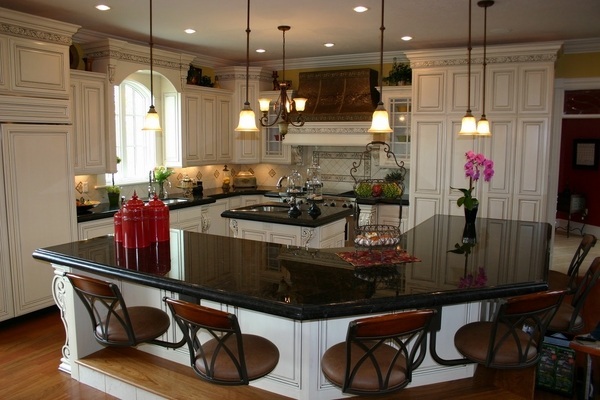 Black kitchen cabinets combined with a dark granite countertop will make the kitchen look darker than it actually is. If you want to combine black kitchen cabinets with a black countertop, it is advisable to choose a backsplash in a bright color to create a visual contrast. Gray kitchen cabinets work best with white, gray and black. Kitchen interiors in these colors are very trendy as they have a modern look and a polished granite countertop accents on the gray color and adds a sleek glossy shine to the interior. How to choose a granite countertop for a colorful kitchen? Red, blue, green, orange, yellow kitchen cabinets are complemented by neutral colors like white, beige or black. 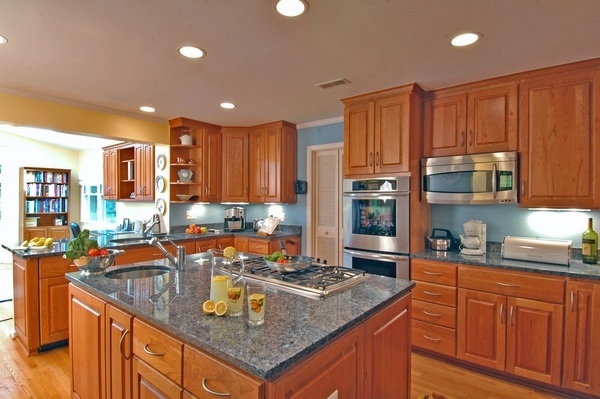 Kitchen cabinets in warm colors like yellow and orange will look great with countertops in beige and brown. Choosing the color of the granite countertop for dual colored kitchens can be tricky. Nowadays many kitchen designs feature two toned kitchen cabinets where the upper and the lower cabinets are in different colors. In such designs it is important to create a balance. 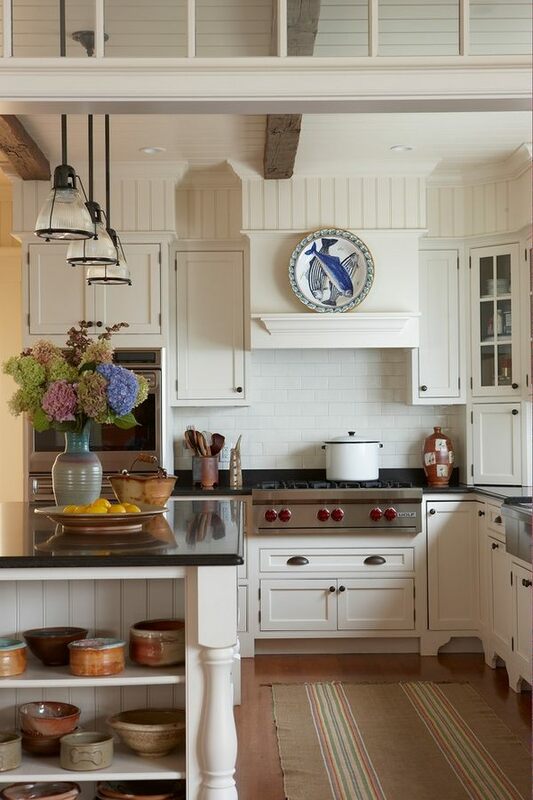 Usually the color of the countertop is chosen to match the upper cabinets as this creates a harmonious feeling. However, when you want to add visual accents and contrasts you could select a color which blends with the lower cabinets and creates a seamless look. 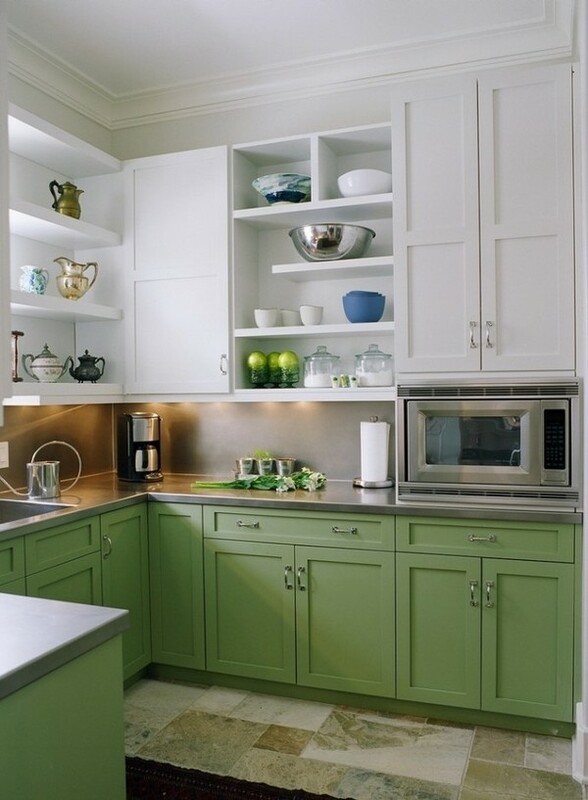 When you have doubts what is the right color for your kitchen cabinets “staying neutral” is always safe. Gray and white will give you a harmonious look. A gray granite countertop will work with stainless steel appliances while black or white appliances will work with white countertop. Choosing neutral colors like black, white or gray does not mean that the countertop has to be in a uniform color. On the contrary, natural stone comes with such wide varieties of veining that from a distance it will look like one homogeneous color but a closer look will reveal the beauty of the specks and deposits. Maintenance of granite countertops – do you need to seal them and how to maintain the perfect look? 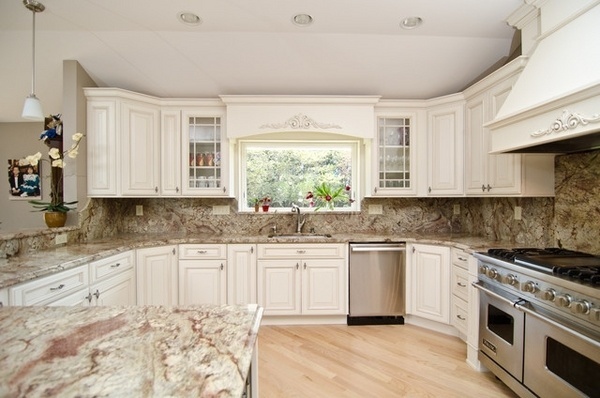 One of the most important topics is the maintenance of granite countertops. The prevent them from staining the surface has to be treated with a sealer as the natural stone is very porous. The sealer is the substance that fills the pores and makes the surface resistant to spills. Homeowners need to understand that a sealer will not make a countertop impenetrable to stains, it will only slow down the absorption of liquids. Another important fact is that there are types of stone that are so dense that can be used without a sealer. However, it is worth remembering that granite is a natural product and needs to be protected. When you are not sure whether the granite type you chose needs to be sealed or not you could perform a simple test. Make sure you have a sample of the slab and do not test the actual countertop slab. Drip some lemon juice on the sample. Do the same with vegetable oil. If you see that the surface of the stone darkens under the liquid within 5 minutes, this would mean that the stone definitely needs to be sealed. If the stone gets darker within 10 or so minutes, a sealer should still be applied. If it takes half an hour or more and the stone does not darken, then it means that you have a very dense type of granite. Despite of all that, it is better to ask an opinion from the seller as they have a big experience and expertise and will be able to give you the best advice. We shall not get into further discussion whether or not a granite countertop needs to be sealed. We shall focus on some useful tips for the daily maintenance which you can develop into habits or good practice, if you prefer. 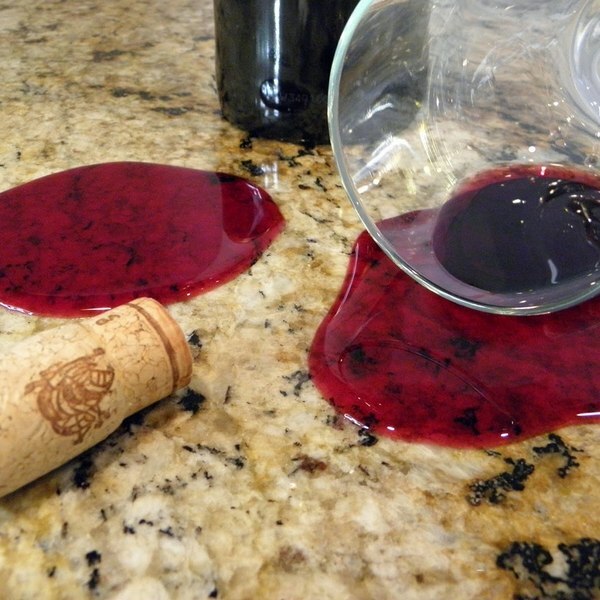 Wipe stains immediately – acidic substances such as wine, coffee, fruit juices, tomato sauce and sodas do not harm the stone but could stain the surface. Hot cooking fat can also stain if not instantly wiped. 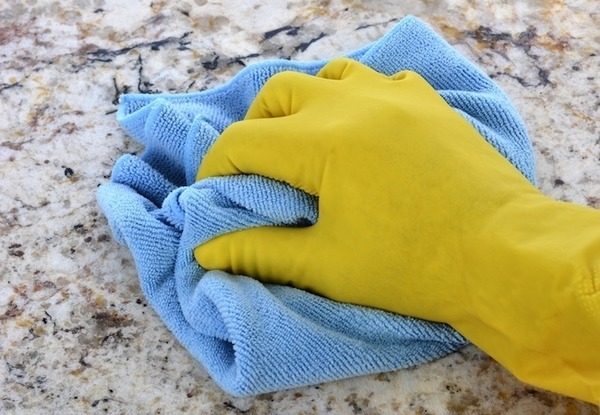 Clean the surface with a sponge or soft cloth. Use detergents specifically designed for natural stone. For minor stains or spills which are wiped immediately, hot water is good enough. 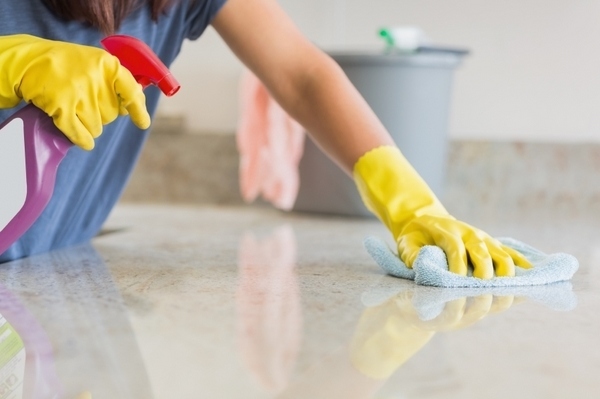 Bear in mind that household cleaners like bleach, kitchen de-greasers and glass cleaners contain acids or alkalis and other chemicals and are not to suitable for cleaning granite countertops. Harsh abrasive cleaning products must be avoided and ammonia, vinegar, orange or lemon should never be used as cleaners. Use pads for all glasses, bottles and liquid soaps on the counter. 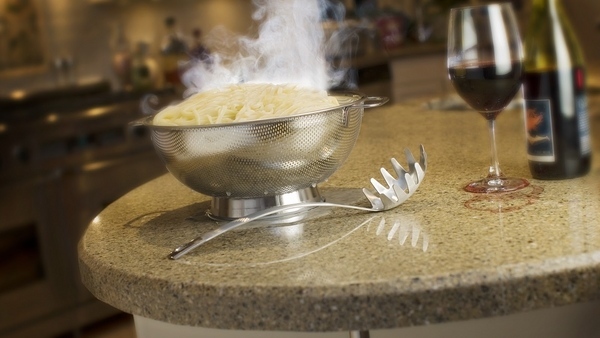 Protect granite from hot surfaces and use hot pads or trivets. Despite the fact that it is resistant to heat, a sudden heat shock may cause a crack, chipping or scratches in the surface. It is true that it is not so easy to scratch a granite, but as we said, using coasters, trivets or hot pads is just a good practice. Reseal your granite countertop every year. Make sure that you use a non-toxic sealer, especially for countertops where food is prepared.